i can’t say that we’ve eaten at pf chang’s very much since our last somewhat damning post on the chain restaurant, but we have been back a few times. if you are dining out with omnivores, or are in a city without much vegan food, pf chang’s can be a life saver. they’ve got locations all over the country, and some decent animal-free options. in fact their entire vegetarian menu is free of animal ingredients, and might be considered vegan, depending on whether or not you eat bone char sugar. buddha's feast: vegetable medley with five-spice tofu served steamed or stir-fried. Steamed Buddha’s Feast – you can add soft tofu or pressed tofu to this dish. Stir-Fried Spinach – garlic, salt and pepper. You can add soft tofu or pressed tofu to this dish. Garlic Snap Peas – garlic, salt and pepper. You can add soft tofu or pressed tofu to this dish. You can also order any vegetable or tofu with a modified sauce. Please ask to speak to a manager and they will be happy to accommodate you accordingly. I hope this information is helpful. excellent! so basically all the vegetarian dishes are safe to eat, unless you wanna avoid bone char sugar. then you can stick with buddha’s feast, the spinach, and the snap peas. 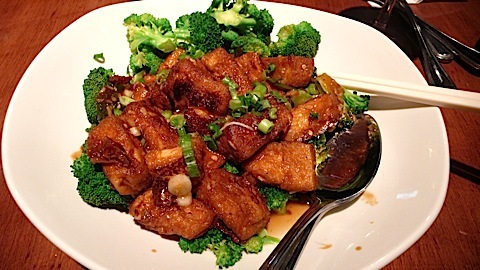 we hit up pf chang’s recently to give the vegan dishes another whirl, and while i wasn’t blown away by the food, it wan’t as bad as i remember it. i got the steamed buddha’s feast, pictured above, which is basically a big old lump of vegetables and sliced tofu. it was tasty and well-prepared, but definitely something i could make at home. 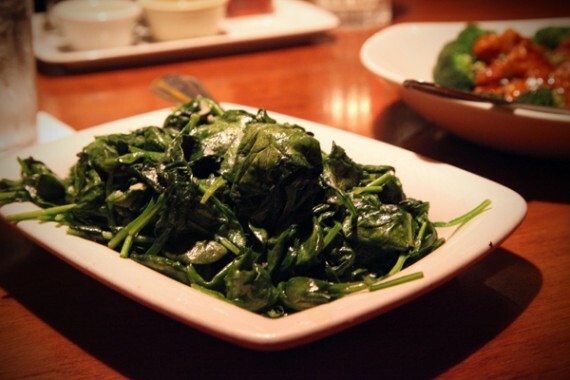 spinach stir-fried with garlic: the name says it all! we also got the spinach stir-fried with garlic to share, which was great. again, a pretty standard dish that i could probably re-create. my husband ordered the ma po tofu (which contains the evil sugar), and it was by far the best dish on the table. the tofu is just cooked so nicely, all crispy and gooey on the outside and so soft in the middle. plus, it comes with a ton of steamed broccoli. check out pf chang’s website for locations. PS: HOW DO YOU FEEL ABOUT BONE CHAR SUGAR? i’m curious. because we all love ronald’s donuts, right? they use bone char sugar. so does zpizza, i think. and i bet sriracha does too. check out this forum thread and chime in. It had to happen. 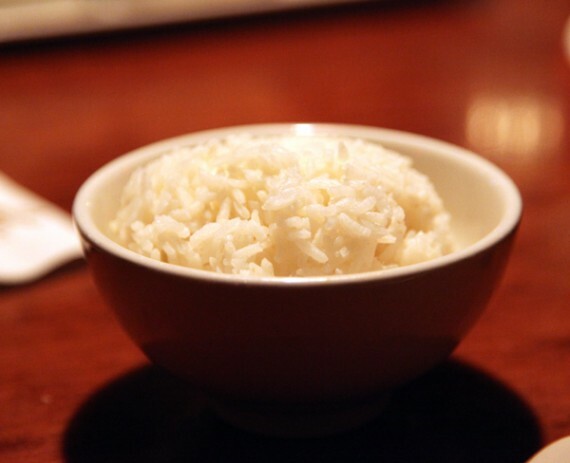 PF Chang’s was destined to fall in to the lower quartile of about-to-be-over midscale dining establishments. You can always tell a restaurant on its way up. Usually they’ll have a decent bottle of wine for under $20, and the portions will be hearty, the service will be snappy and the entire establishment will be clean, calm and collected. How things have changed from when PF Chang’s China Bistro fitted into that category. I recall waiting, on a regular basis, for 90 minutes outside an outlet in Denver. The wait used to be so long that I could get my name on the list, then go to the nearby Park Meadows Mall, drink a beer or two and then return (with bleeper stuffed into my overtight hipster jeans) to the restaurant in order to wait…. and wait…. and….z….zzzzzzzzz. Well, that was in 1999, and this is now. The PF Chang’s at the Beverly Center in LA is usually half-empty on a Saturday night. The tables that used to be so clean and polished have now lacked the luster — some even have carved in graffiti that’s been there forever. And, over the past year or so, the margin-enhancing, cost-cutting measures have kicked in earnest. Let’s start with my favorite dish: Ma Po Tofu. This dish is now very small. Sure, enough sodium and fat to keep me in heart disease and obesity (respectively), but a far cry from the Ma Po Tofu of old. You can see in this one that the tofu pieces are larger (but far less) and there’s less sauce and broccoli than there used to be. AND IT GETS WORSE. There are a few chain restaurants, found in most US towns and cities that can serve vegans very well. Sometimes we like the predictability of a known dining experience, and “the PF” certainly provides that. What you’ll find in every restaurant is a waiting line (although shorter than they used to be, and reservations can now be phoned ahead) and a nice table in a dark room usually with a spotlight in your face from a mile above your head. Although seating can be efficient, a 10 minute wait for your server to initially materialize is commonplace on busy nights – especially weekends. Vegan appetizers include Lettuce Wraps and Steamed Dumplings (both very good). My favorite vegan entree (in fact the only one I’ve ever had in the hundreds of times I’ve been to P.F. 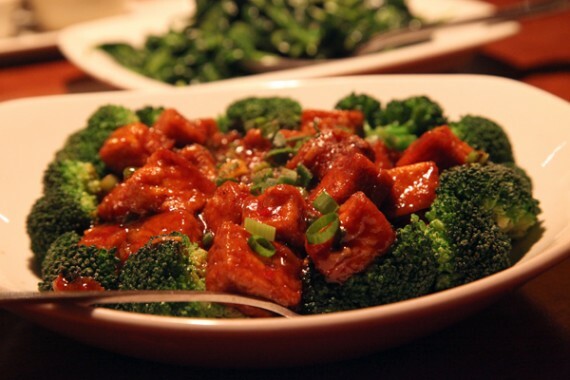 Chang’s – see picture above) is Ma Po Tofu, an amazing well flavored and presented interpretation of the classic Chinese dish (which usually contains pork). Note that the kitchen is VERY efficient at preparing food (banks of microwaves?) and is usually way faster at getting it to your table than you are at eating it, or than your server is to bring your drinks. On more than one occasion I’ve ordered drinks, appetizer and entree at the same time to have the appetizer arrive first, followed shortly after by the entree and then the wine as I’m half done with the entree. I recommend ordering serially, wait for something to arrive before you order the next thing. Also, note that the wine is horrendously marked up. A bottle of Night Harvest Cabernet that I can get for $4.75 with my Ralph’s club discount card costs a whopping $26.50. For the mathematicians out there that’s a five zillion percent mark-up. 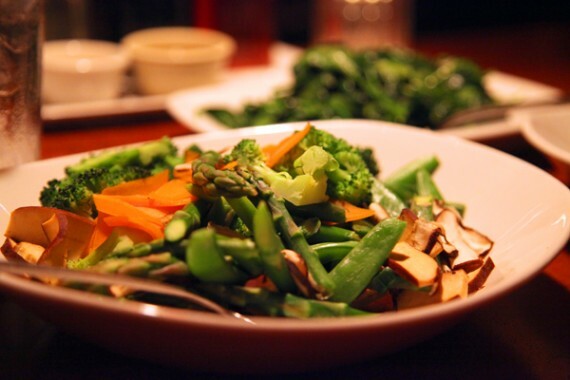 No vegan deserts, so fill up by adding some side dishes – the Spinach Stir Fried With Garlic and Asparagus are very good, as are Buddha’s Vegetables.